I know that some parents are happy to let their kids play with their own phones and tablets, especially with the plethora of child-friendly apps on the market right now. But there’s always the possibility of little ‘accidents’ during a hectic spell of Angry Birds. That should be less of a problem with the newly-launched Samsung Galaxy Tab 3 Kids. Yes, Samsung has a child-friendly tablet – and not just a glorified toy. 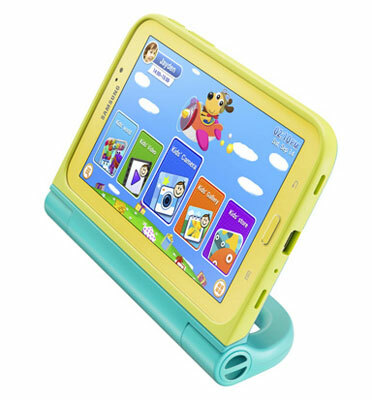 Yes, it has a colourful case, handle and a rugged body, along with a child-friendly interface, pre-loaded educational software, games and apps and its own dedicated kids app store. But it also has a 7-inch screen, a 1.2GHz dual-core processor and Android Jelly Bean for the operating system, So power enough to tackle the toughest games. On top of that, it will offer a time-management feature that locks the tablet after a certain amount of time and a stylus-type tool for drawing and writing. Much will depend on the price as to whether the Samsung Galaxy Tab 3 Kids will take off as a viable alternative to a ‘full’ tablet. We should find that out later in the year, with the tablet scheduled to hit the UK in time for Christmas.